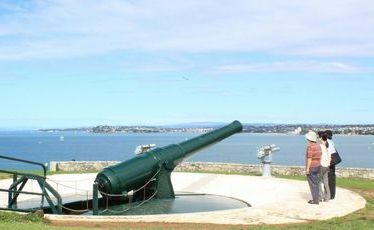 THE massive eight-inch barrel of the disappearing gun, which has stood on Auckland's North Head for 125 years, seemed to be pointing at the Waiheke ferry which was zooming past across the Waitemata Harbour. Not quite the Russian warships the colonial government had in mind when it bought 10 of these guns in 1886, but it would do. I hauled on the lever and the gun raised slowly out of the pit in which it had been lurking. Fire! I imagined the 95kg shell hurtling across the water towards the ferry. Meanwhile, the recoil sent the gun back down into the pit where it could sit in safety until next time. Unfortunately it wasn't the actual disappearing gun that I was raising and lowering but a model installed in the underground chamber just behind the real thing - which can't move - to give an idea of how the guns used to work. It's the latest step in the Department of Conservation's ongoing programme to help visitors enjoy the complex of tunnels, observation points and gun emplacements developed on North Head during the 140 years it was a key part of New Zealand's defensive system. Further up the hill I came across one of the uniformed volunteers who, in the 1860s, helped create these defences. Well, okay, he was only a lifesized cardboard cutout, but he did help give a feel for the different stages North Head has gone through. Further on, I also met one of the colonial artillery officers who manned the guns during the renewed Russian scare of 1886-1908, the soldiers who expanded the defences in the two world wars and a wireless expert from the Navy Communications Training School which sat on the summit from 1958 to 1996. DoC archaeologist Dave Veart said the next stage in telling the hill's story would probably be to put a small light and sound show in one of the concrete bunkers. "It's all about allowing people to experience the history of North Head which, after all, goes back to the arrival of the first Maori, takes in the beginnings of colonial settlement and includes the evolution of our defence forces." And one day that experience might even include a chance to make the real disappearing gun go up and down, as it did 100 years ago, instead of a model. "I do have an estimate from Colin Zeff, who's done a lot of work for Motat, who reckons he could get the gun moving again for around $140,000," said Veart. "What he's come up with is quite a simple solution, really, so if someone wanted to take that on, to put up the money for the project, we could make the disappearing gun disappear again."